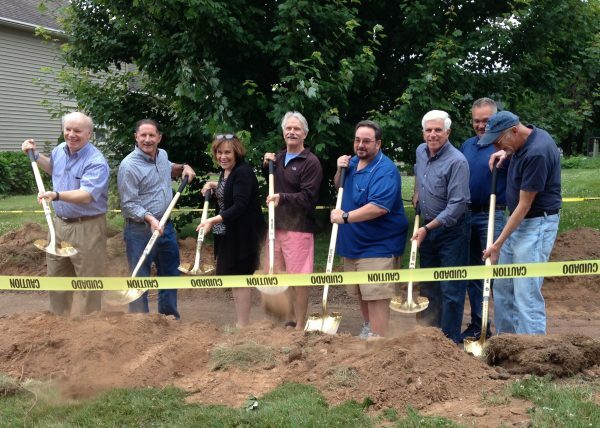 On June 27, 2018, members of Portland’s Sidewalk Committee and Board of Selectmen held a ground-breaking ceremony for the $1 million sidewalk improvement project. Approximately 2 miles of cracked and uneven sidewalks in the Town’s central residential area will be replaced with brand new concrete sidewalks over the next year or so. John Hall and Bob Herron (Jonah Board member & Treasurer) are co-chairs of the Sidewalk Committee. PIctured above (left to right) are Bob Herron, Selectman Ralph Zampano, First Selectwoman Susan Bransfield, John Hall, Selectman Jim Tripp, Selectman Lou Pear, Director of Public Works Bob Shea, and former Selectman Fred Knous.